We don't live in a data democracy. Every day, we give over more of our data to people we don't know, whose motives we may not fully understand, and the possibility of our getting it back is very slim. Unlike in a democracy, we don't get to vote in the leaders of companies who build the programs and sites that harness and manipulate our data. We don't get to set term limits on CEOs or throw the bums out of corporate offices if our data is used in ways that are unsavory. And just like our tax dollars, we keep creating more and don't always know where our data is going to end up. 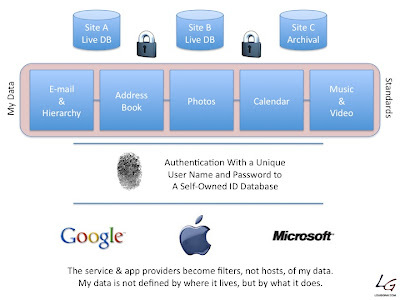 In today's world, as much of the data we create transitions from offline to online, and from our personal computer hard drives to the cloud, we are being forced to make choices in terms of what companies we trust, what services we believe will have a future, and what applications or Web sites can do what with our data. If we choose wrongly, we stand in danger of losing data, losing access to that data, losing historical data or metadata. Our data could be compromised by ill-meaning people, or simply cannot be moved, written once and made to lack true portability. As I said in January, I think the time has come to deliver personal clouds with OS and application-neutral data. I don't want to be forced to accurately guess the right programs and providers, and I want anytime instant access to my own personal data, including contacts, relationships, rich media, e-mail, documents and more from any device. We have not yet scratched the surface of data interoperability and portability between services and devices. While work on standards continues, there remain significant challenges, and often, as they do in government today, politics play a big role, between and often inside companies. Is what is in your best interest also in the best interest of those storing your content? And should they be one and the same? The ability to export one's social profile from network to network. The ability to export one's shares and postings from network to network. The ability to change blog software back-ends quickly, without losing content. The ability to change blog comment providers quickly, without losing data. The ability to change e-mail providers without long and tricky transfers. The ability to purchase applications once even if you change operating systems on mobile or desktop. The ability to access one's purchased media from any device if you provide your identity. The ability to access one's bookmarks and history from any browser if you provide your identity. The ability to access one's contacts and messages from any browser or e-mail client. The ability to export one's social graph and reconnect it in a new place. The ability to purchase media once even if you change media sources. The ability to switch carriers without penalty. The ability to collaborate with people across geographies, OS and Web browsers. The ability to add actions to entries (such as likes or comments) and have them flow to all entry points. The ability to migrate from one RSS reader or shared link blog and not lose subscribers. The ability to download all videos and images in one's network rapidly. These are just a few ideas off the top of my head, and the list could no doubt grow dozens long with your input and more hours spent trying to learn just where our data goes when we hit publish or submit. I am trusting an increasing amount of my data to the cloud with every post I write, every status update, every photo I upload, or every video I add to YouTube. With more than a decade and a half of activity on the Web, the legacy of my choices often impacts what I can do in the future, or the speed at which I can make change. I have had to walk away from created data before, and I have had to make compromises on choice or accept things as less than ideal much more often. There are people out there working on very real standards to let our data move from place to place without hiccups - such as those hammering away on the DataPortability Project. Some of these issues are being solved in front of our eyes, while others are getting much worse. On a day when one nation is celebrating with big words like Freedom and Independence, it's worth knowing just who owns our data now, and striving to one day see a time when it can truly be moveable and independent - not beholden to any company, service, software or environment. That would be a day worth celebrating.